This Saturday, Fenton Street Market hosts local skaters and activist Maryam Balbed - perhaps better known as Sk8ter Mom - for a celebration of skateboarding and push to build more skateparks in this area. Local skateboarders step off their boards to greet the public on Saturday, June 12, in the Village Square of the Fenton Street Market in downtown Silver Spring. Stop by anytime between 10 a.m. and 3 p.m. for stories of skateboarding for positive change, simple demos on safety and skateboard maintenance, and indie videos and photography of local skateboarders. Skateboarding is an enduringly popular sport, but communities often battle over where and when it should take place. 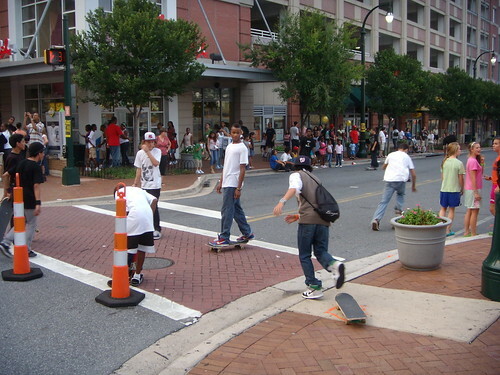 The June 12 rally is an opportunity to think proactively about the role of skateboarding in Silver Spring. Participants will be invited to sketch their concepts for a dream skatepark and view plans currently on the boards for a park in Woodside and Laurel. Maryam Balbed, locally reknowned as “Sk8ter Mom,” leads the event in cooperation with the CD & Game Exchange, which will be exhibiting skateboards in the marketplace. A petition supporting local skateboard park development will be on hand those who wish to support it. The program is one of many free educational events taking place in the Downtown Silver Spring-sponsored Village Square at the Fenton Street Market, a new outdoor market happening every Saturday in downtown Silver Spring. More than 60 local artists, craftspeople, collectors, importers, inventors, and more exhibit at the Fenton Street Market each week. Every Saturday features a fresh roster of exhibitors, plus live music and educational events, from 9 a.m. to 3 p.m. at the corner of Fenton Street and Silver Spring Avenue. Come see what's new! When: Saturday, June 12, 10 a.m. to 3 p.m.
Where: Fenton Street Market, Fenton Street and Silver Spring Avenue, Silver Spring, Md. It's exciting to see skateboarding get a higher profile in Silver Spring, and it certainly wouldn't have happened without the work of Sk8ter Mom. Of course, kids have been skating here forever, and you can't go downtown without seeing them. But it's important for them, and for us, to recognize that they play a role in the community as well. I wasn't surprised to find that the lack of skateparks was a concern at last month's charrette at Fenton Street Market. Unfortunately, skateboarding doesn't have the cultural relevance here that it does on the West Coast, however. 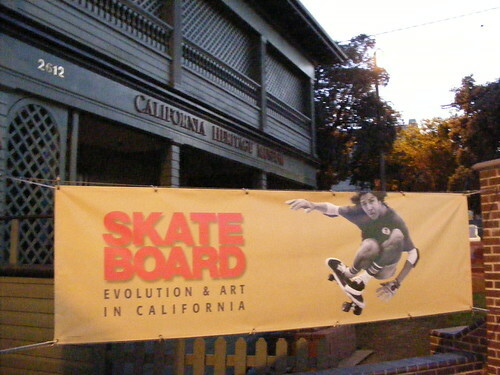 When I visited Los Angeles last winter, I was surprised to find a California Heritage Museum with - what else - a year-long exhibition called "Skateboard: Evolution in Art in California." It's not quite a museum, but giving skateboarders a day at the market is close enough.